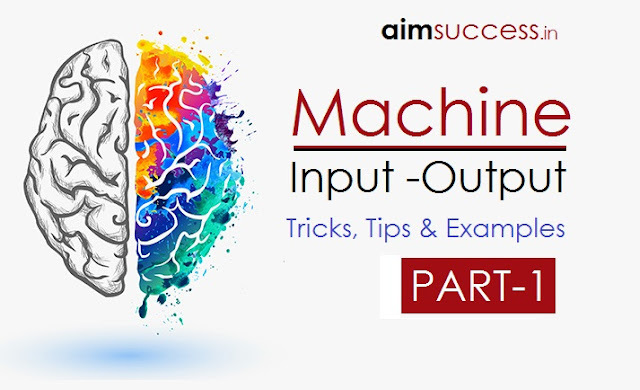 Input Output is one of the easiest topic of Reasoning ability section in Exams. You just need to give in a little hard work and you’ll be able to score marks easily in this topic. Today, we will discuss about this topic in depth and the types of questions that you may come across. First off – don’t look at an I/O question and skip it! It maybe an easy one. Look at the Input – see what you are up against. Only words/alphabets or only numbers or alpha-numeric combination. Then ignore every step and go straight to the last step – now concentrate how they’ve finally arranged the input. (i) if only numbers – then in ascending or descending. you may have a number and a word in alternating pattern, where – the numbers will ascend or descend – and the words will have their own A-Z/Z-A pattern! Then look at the first step – and identify – how they have started out with the arrangement.Are they taking a number first? If so highest or lowest number?Is the number introduced in the step from the front of the sequence or from the last?Same thing will apply to words too. For question where they give a separate set of Input for every sub-question and asks you to identify if it is ‘Step III’? – Or, asks you to give the number of steps required to solve a particular input sequence – my sincerest and honest advice is – quickly solve it!There will be 100% chance of you being correct! Step IV is the last step. In the above arrangement, in each step one word is arranged one step at a time from left to right in ascending alphabetical order. Alphabetical in case of words. Increasing or decreasing in case of numbers. According to number of consonants or vowels in each word. According to the words beginning with consonants or vowels. According to even numbers or odd numbers. The arrangement types of questions also consist of various types of categories such as; Single shifting arrangement, Double Shifting arrangement. After observing the arrangement, we can conclude that in first step; word is arranged in left side in ascending order and in second step number is arranged in left side in increasing order. The process continues till the last step. Special Note: After arranging word “house” in step III our next arrangement will be “22”, but is already come in its place without arranging, so we will not count 22 in our next step and move to word “land” which will be arrange step IV. The same case is repeated in step VI, after arranging the word “never” our next arrangement will be “59”, but is already come in its place without arranging, so we will not count 59 in our next step and move to word “sold” which will be arrange step V.
Step IV: is the last step of the arrangement of the above input as the intended rearrangement is obtained. After observing the arrangement, we can conclude that in each steps; the numbers are arranging in decreasing order on the left end and words are arranging in alphabetic order on the right end. The process continues till the last steps. Special note: In arrangement problems, we cannot find previous step. If Step IV or Step V is given and in question and it was asked to find the previous step, we cannot find it. So, our answer will becannot determined. For arranging the logic of arrangement you are advised to follow a certain things. Have a glance at the first and the last step. This will give you a rough idea of what really happened in between the steps. Have a quick glance at every step to know how this is being carried out. Rearrange the given input step by step or if required move from final step to the input. The revamp is occurring from left to right. The revamp is occurring single word at once. The revamp is done on the premise of diminishing alphabetic request. Number every word/number in the way appeared above according to their request of course of action as per the example portrayed in the inquiry. Consider it an orderly procedure. After every numbering, you have to stop and check. After you recognize the primary component, number it (1). At that point distinguish the second component. Check every one of the components to one side. Have you numbered every one of them yet? On the off chance that yes, then number this one (1a). If not, then number it (2). At that point distinguish the third component. Check every one of the components to one side. Have you numbered every one of them yet? On the off chance that yes, then this doesn’t get another progression number. Assuming no, then it gets a new stride number. What’s more, the procedure proceeds. Here is a delineation.